The human-bird relationship is integral to the practice of falconry. This course will show how falconry is rooted in animal welfare: falconers are inevitably drawn into conservation of raptors. The first lecture will demonstrate how new technologies have made falconry more accessible to a wider public, allowing a higher standard of practice than ever before. The second lecture will examine the culture of falconry, its history and different styles of practice. Hines, R. 2016. No Way But Gentlenesse: A memoir of how Kes, my kestrel, changed my life. New York: Bloomsbury. 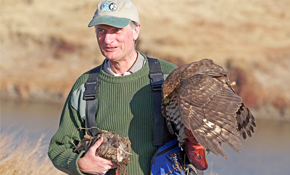 Dr Adrian Lombard, a doctor in private practice, has been involved in falconry since the age of thirteen. Fascinated by the complexity of living and partnering with a hunting raptor, his specialty has been flying black sparrowhawks in the Western Cape. He has represented South Africa at the International Association for Falconry and the Conservation of Birds of Prey since 2004 and became President of this organisation in 2012.